In Seoul and smaller towns many places will be closed as Koreans opt to spend the time at home with their families. Some attractions remain open though and it's a great time to visit them because they will most likely be quieter than usual. One such place is Everland. Currently they have a Halloween theme which is actually one of my favourite times to visit the park. Definitely beats the 'Rose Festival' theme! Happy Halloween theme festival at Everland in South Korea. The park is decorated with lots of Halloween items. Everland, in my opinion, is like a dodgy copy of Disney World. Most things in Everland seem to have a strong likeness to things in Disney, from the park's mascots, who bear a lot of likeness to Minnie and Mickey, to the 'cast member' uniforms and even the trash cans. That's not to say it's not worth a visit though, I actually love this place. If you've visited Disney a few times and are a big fan, like myself, then just be warned it's not as good as the real deal. It is certainly a LOT better than Lotte World though! This photo was taken on my visit to Everland's Happy Halloween Festival last year. This was the day after Chuseok and although busy, it wasn't as busy as it looks in this photo. Everland has several rides that shouldn't be missed! There is a river raft ride called Amazon Express which is good fun but you may get a little wet and if you're unlucky very wet. There's a Safari bus ride in which you drive through enclosures where the animals roam around freely. When I went on this ride there were Lions, Tigers, Giraffes, Elephants and Bears. A lot of the animals actually come right up to the side of the bus you travel in. My favourites which are not to be missed are the two big roller coasters, T-Express and Rolling X-Train. Additionally there is a log flume and a lot of 'fair ground style' rides too. T-Express Wooden roller coaster at Everland. T-Express is the steepest wooden roller coaster in the world. There are sudden drops and sharp rises travelling at 104km per hour. There is a a height requirement for this ride of 130cm. Additionally if you're over 195cm you can't ride. Rolling X-Train Roller coaster at Everland. Rolling X-Train is very fast roller coaster that includes two 360 degree loops and lots of sharp turns and twists. There is also a height requirement on this ride which is 120cm. I actually prefer this ride to the T-Express ride. When nightfall comes there is an area of the park you can visit to see scary Halloween characters wandering around. Word of warning though, it may scare children if you're visiting with your family. Or if you're a wuss like me it might scare you too. Everland park's Halloween Festival at night. Within Everland there are also numerous souvenir stores and dining options. They have a lot of fast food outlets, some Korean dining options and a few places serving things like pasta and pizza. There is also a 'Weeny Beeny' candy store when you first enter the park so you can get your sugar fix for the day. One of the dining options in Everland. Special Chuseok Discount for Foreigners! Currently there is a discount available for foreigners. So you can visit up until the 14th for 23,000 won! There is also a discount for people wishing to visit the water park that's alongside Everland, Caribbean Bay. It's just 18,000 won, that might have something to do with the bad weather! Click here to download the coupon from the Everland official website. Now that you have your coupon you'll need to know how to get to Everland?! If I've missed any information that you'd like then you can check out the Everland website in English. 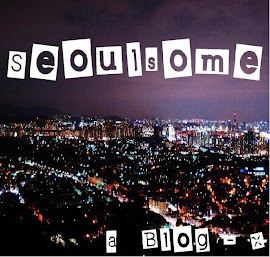 Please follow my blog for more information about great places to visit in Seoul. Have a happy Chuseok everyone! UPDATE: The special Chuseok discount period has now finished. There will probably be more discounts offered throughout the year so make sure you follow Seoulsome or 'like' Seoulsome Blog on Facebook to get more news about discounts in the future! Labels: Chuseok, Discounts, Everland, Korea, Seoul, Seoulsome, Theme Parks, What to do today?